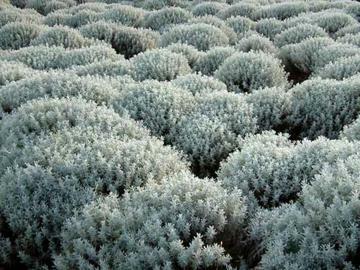 Compact, rounded shrub with grey-white woolly foliage. Bright yellow flowerheads on slender stems in mid to late summer. Strongly aromatic. Prefers light (sandy) and medium (loamy) well-drained soils. Will grow in nutritionally poor and also very alkaline soil. It requires full sun will survive in very exposed maritime locations and is very drought tolerant. Tendency to become lax and open, especially if grown on moist fertile soil. Prune fairly y hard in April to promote new bushy growth. Seed or half-ripe cuttings taken from side shoots.